Looking for that special piece of trim? We carry a range of mouldings in stock (see our catalog). If we don't have it in stock we can custom make it. 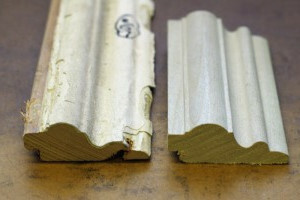 We take great pride in our ability to manufacture high quality mouldings in nearly any specie of wood. Most any profile can be duplicated with our modern moulding machinery. Check out our Services page to see how we can create a new piece of moulding matching an existing pattern. Since Portsmouth Lumber's inception, most of the interior and exterior trim and other millwork has been manufactured on site thus ensuring a quality product. Quality is further enhanced by the technologically up-to-date moulding machines used in Portsmouth Lumber's milling facilities. Portsmouth Lumber also boasts a large warehouse and yard to store and display a wide variety of quality mouldings, plywood, windows, doors, and millwork. Centrally located in the Tidewater, Virginia area, Portsmouth Lumber provides delivery service throughout southeastern Virginia. Delivery service also extends south into northeastern North Carolina, including the Outer Banks. With an inventory of over one million lineal feet in nearly 200 profiles of moulding, Portsmouth Lumber has the ability to provide delivery of an entire house job of trim on just a few days notice.